Beyond Bloomberg, other news partners will include Cheddar, BuzzFeed News, and The Verge, Twitter said. Each will have its own live show, such as BuzzFeed's "MorningFeed." Concert promoter Live Nation will be broadcasting "select" events and other material on Twitter, the first stream being a May 13 concert by the Zac Brown Band. Other acts lined up so far include Train, Portugal. The Man, August Alsina, and Marian Hill. IMG Fashion will present "exclusive runway shows and behind-the-scenes Fashion Week content," Twitter said, while Propagate's "#WhatsHappening" will be a live primetime show about "everything in the world that embraces Twitter's unique conversation," though with a pop-culture focus. Sports programming will include weekly regular-season WNBA games for 2017-2019, a Players' Tribune Q&A show called "#Verified," and expanded PGA and MLB coverage, the latter including a 3-hour weekly live show. A dedicated sports channel, Stadium, will stream 24/7, mixing in live college games, highlights and classic games, and lastly some daily studio shows. 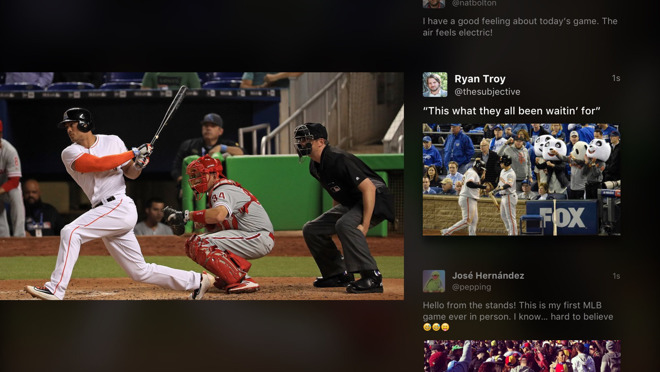 Twitter has been pushing more and more deeply into live video as a way to attract users, trying to allay investor concerns that it doesn't have a way of boosting those numbers or ad revenue. It has also adopted some other improvements, such as a clampdown on abuse, and did recently see a user uptick. Apple is thought to be pursuing a similar strategy with Apple Music, using original video as a way of pulling in subscribers. The company could introduce up to 10 original shows and documentaries by the end of 2017, including star-studded entries like "Carpool Karaoke."